If you need an ambulance, show the sentence below to a Japanese person and they will call one for you. HOW CAN I CALL AN AMBULANCE IN JAPAN? 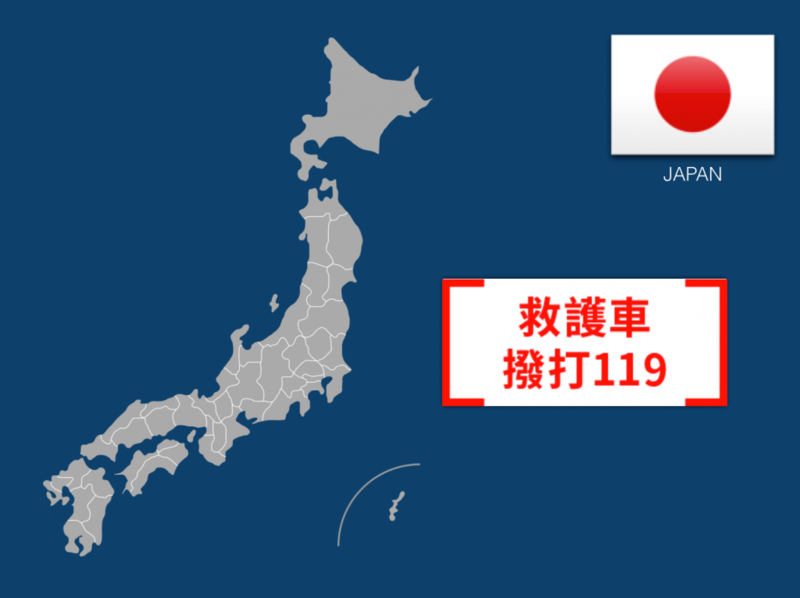 Yes, calling 119 is possible nationwide. During disasters and other complex emergencies, you can call 171, run by NTT West and the National Disaster Information System which is operated by the national government to provide/exchange info about impact/damage of the disaster and available hospital resources. Emergency response and transport is provided by conventional ambulance in Japan. Sometimes the fire brigade will assist ambulance personnel; doctors may also be dispatched in regular vehicles to arrive more quickly and begin providing care while waiting for the ambulance to arrive. Emergency medical response and transport by ambulance in Japan is funded entirely by the public; patients do not pay out of pocket for transportation. However, in 2015, the Japanese government began to re-examine this policy: “Citing the Fire and Disaster Management Agency, it said that about half of patients being transported in emergency vehicles don’t have serious illnesses in need of hospitalization and that only 9% of patients had conditions considered life-threatening.” [Source: Wall Street Journal] It is unclear if these changes were made official or not. Japan’s Ministry of Health and Welfare oversees and regulates emergency medical and ambulance services. Abe T et al: “Association between helicopter with physician versus ground emergency medical services and survival of adults with major trauma in Japan.” Critical Care. 2014 Jul 9;18(4):R146. doi: 10.1186/cc13981. Abe T et al: “Descriptive analysis of patients’ EMS use related to severity in Tokyo: a population-based observational study.” PLoS One. 2013;8(3):e59738. Hagihara A et al: “The aging population and future demand for emergency ambulances in Japan.” Internal and Emergency Medicine. 2013;8(5):431-7. Hori S: “Emergency medicine in Japan.” Keio Journal of Medicine 2010;59(4):131-9. Koike S et al: “Collapse-to-emergency medical service cardiopulmonary resuscitation interval and outcomes of out-of-hospital cardiopulmonary arrest: a nationwide observational study.” Critical Care. 2011;15(3):R120. Lewin MR, Hori S, Aikawa N: “Emergency medical services in Japan: an opportunity for the rational development of pre-hospital care and research.” The Journal of Emergency Medicine 2005;28(2):237-41. Morimura N et al: “The impact of an emergency telephone consultation service on the use of ambulances in Tokyo.” Emergency Medicine Journal. 2011;28(1):64-70. O’Malley RN, O’Malley GF, Ochi G: “Emergency medicine in Japan.” Annals of Emergency Medicine 2001;38:441-6. Tanigawa K, Tanaka K: “Emergency medical services systems in Japan: past, present, and future.” Resuscitation 2006;69:365-70.